In a press conference held on May 25, 2016, top mutual fund managers addressed more than two-dozen journalists from key financial industry and popular news organizations. In a press conference held on May 25, 2016, top mutual fund managers addressed more than two-dozen journalists from key financial industry and popular news organizations. SunStar Strategic, a Washington DC area public relations and marketing firm hosted the event in New York City. Speakers were invited to participate based on their funds’ ratings by Morningstar, an investment research and investment management firm. These advisors have shown their ability to successfully navigate the volatile markets of the recent past. 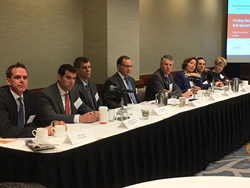 Presenting were executives and portfolio managers from fund advisors: Brian Milligan, CFA, Schwartz Investment Counsel, Janet M. Brown, FundX, Eric Marshall, CFA, Hodges Capital Management, Robert D. McIver, Jensen Investment Management, Andrew R. Adams, CFA, CIC, Mairs & Power, Benjamin A. Richer, Nationwide and Eric Lynch, Scharf Investments. Among those who attended the morning breakfast conference were representatives from Forbes, Barron’s, the Wall Street Journal, Investment News and USA Today. Overall the advisors shared a commitment to continued investing in the broad equity market within the context of careful selection of companies where they have strong conviction buoyed by unquestionable risk management techniques. Each manager provided insight into their firm’s outlook for the investing landscape in their written remarks, most noting that the foreseeable future for investors will be challenging. SunStar Strategic’s media events provide its clients the opportunity to address large groups of online and print reporters in a single setting with the added advantage of give and take among the presenters and audience. SunStar Strategic arranges media events for individual companies as well as groups of firms within an industry. The firm’s public relations practice is grounded in helping each client better identify and consistently articulate its unique value proposition, offering message development workshops, interview training, coaching and ongoing public relations work. The firm’s creative services group supports clients with traditional collateral and new media. For more information, visit http://www.sunstarstrategic.com.